Matthew Rozier, IP counsel at Snell & Wilmer, speaks to the business members gathered at an NNBW "Industry View" event centered on protecting intellectual property and assets on Thursday, Feb. 15, at the Atlantis Casino Resort. Ruby Russell, co-owner of Sparks-based Stayput Beddings, believes she has a trademark and patent upon which is being infringed. 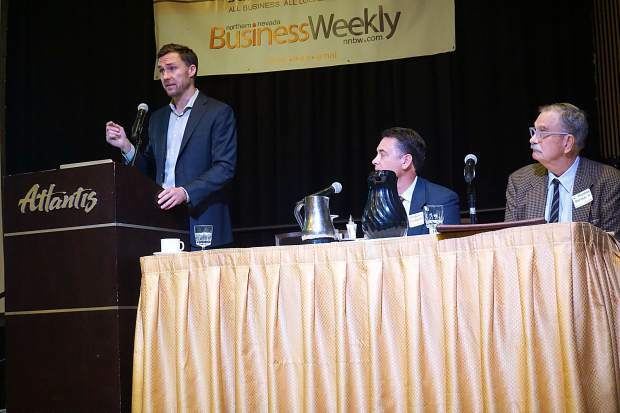 This was the chief reason why Russell attended “Intellectual Property: Tips and Strategies for Protecting your Company’s Assets,” an Industry View event sponsored by the Northern Nevada Business Weekly and Snell & Wilmer that took place on Feb. 15 at the Atlantis Casino Resort. Russell, who co-owns Stayput Beddings with her partner, Louie Scheel, came away from the event with increased confidence that intellectual property lines were in fact crossed. Speaker Matthew Rozier, IP counsel at Law Offices of Snell & Wilmer, told the 80-plus business members in attendance to simply think of intellectual property as land that they own. The process of getting a patent, however, is rocky terrain. Rozier said the negotiation process can last years. Also, after people publicly disclose an invention, they have one year to file a patent before the “ship has sailed” and they lose the right to patent the idea. With respect to intellectual property, speaker Gregory Livingston, general counsel at Sierra Nevada Corporation, also stressed the importance of having employees sign nondisclosure agreements to make it “very clear” they keep IP information confidential. Event attendee Rena Zatica, co-founder of Front Office Staff, a virtual receptionist service, was struck by the necessity to even have prospective clients sign NDAs.